The Wallaby Track: Thank goodness for common sense. We’d all be in trouble if people took certain road signs literally. 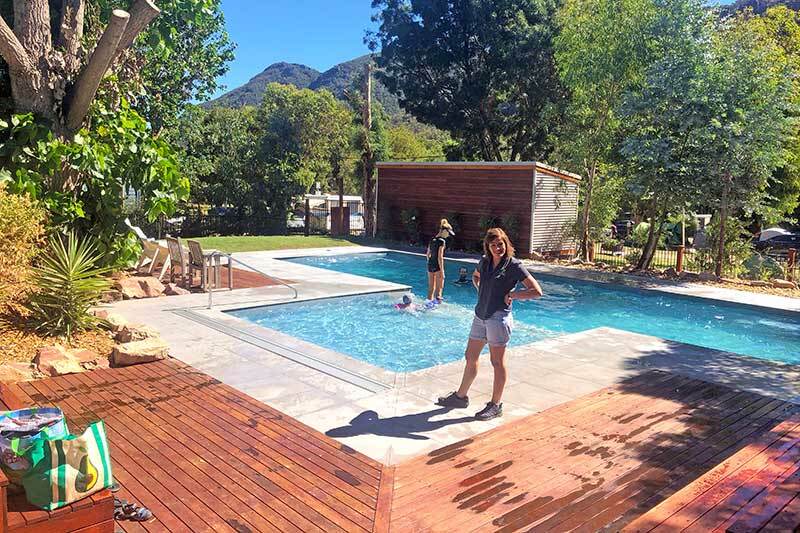 I’m on the permanent free coffee list at the Halls Gap Lakeside Caravan Park, Vic, and when I called in recently, owner Josephina was keen to show me the park’s latest improvement – another lovely new swimming pool. With the hot weather we’d been having, the extra pool seemed a good idea and I got Josephina to stand near the pool for a photo, although she protested that she would spoil the pic. Josephina strikes a pose by the caravan park’s new pool. Josephina is off to her native Holland soon to see her mother. Then she and husband, horse trainer Rohan, are going to tour Australia for three months – they have a great staff and will be leaving the park in good hands. The park is just over the dam wall of lovely Lake Bellfield, which supplies water for the township of Stawell and is one of the many attractions in Halls Gap and the scenic Grampians area. There are a lot of silly road signs. I came across this sign (below) when out walking in Hamilton, Vic, during a recent muster of the Gippsland Gypsies branch of the Australian Caravan Club. I don’t know how many people would mistake the driveway for a road. There’s one I see a lot (below) and although I do my best to obey the admonition to speed, my little Getz is not a Formula 1 racing car, so I’m afraid I can’t speed too much! I pass the one in the pic most days and so far I haven’t seen too many speeding locals despite the sign. I guess you all notice silly signs as you drive around this great country, including the ones on narrow bridges where you are told there’s no overtaking or passing on the bridge – as if you could or would! The Gippsland Gypsies branch of the Australian Caravan Club is celebrating it’s 10th anniversary muster at the Glen Cromie Caravan Park in Drouin, Vic, and it doesn’t seem possible that 10 years have passed since the inaugural meeting at the Warragul Caravan Park – a great day and many of the people there on that day are still keen branch members. The Gippsland Gypsies came into being at a muster, called by the ACC, in Warragul on March 20, 21 & 22 2009. This meeting was an outstanding success and plenty of friendships were formed from the outset. It was very evident that the Gippsland Gypsies was going to be a very active and strong branch of the ACC. Yarra Valley. The muster was well attended with 12 caravans turning up, despite the very wet conditions a good time was had by all. We held our first happy hour and raffle around the open fire on the Friday night. On the Saturday we met up with the park ranger and watched a very informative movie on the Tarra Bulga National Park, after this we walked the suspension bridge before returning to the fire for happy hour. On Saturday evening we caught a bus into Yarram for dinner at the Yarram Bowls Club. It was a fantastic night. held a quick meeting to talk about what went right and what did not go so well over the weekend. I was privileged to chair that first meeting, have been a keen member of the branch for many years and have attended many great musters, including the recent one at Hamilton – a mere 130km from home. I came across these little words of wisdom while clearing out the shed the other day and they made me grin. They are a bit old but I thought I’d still share them with you. If you’re feeling good, don’t worry, you’ll get over it. No matter how long or hard you shop for an item, after you have bought it, it will be on sale somewhere cheaper. No one’s life, liberty or property are safe while parliament is in session. If you fool around with a thing for very long, you will screw it up. A $300 dollar picture tube will protect a 10 cent fuse by blowing first. Any tool dropped while repairing a car will roll underneath to the exact centre. When a broken appliance is demonstrated for the repairman it will always work perfectly. Everybody should believe in something. I believe I’ll have another drink. You will remember that you forgot to take out the rubbish when the garbage truck is two doors away. The race is not always to the swift or the battle to the strong – but that’s the way to bet. There’s never time to do it right but always time to do it over again. Everything west of Alice Springs will eventually plunge into the Indian Ocean. The light at the end of the tunnel is the headlight of an oncoming train. Beauty is only skin deep. Ugly goes to the bone. A Smith and Weston beats four aces. If everything seems to be going well, you obviously don’t know what is going on.